It was love at first sight when we first saw it at one of the garden nurseries along Jalan Sungai Buloh in Selangor. 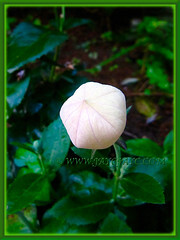 Their beautiful five-petaled, star-shaped flowers and balloon-like flower buds enthralled us so. Absolutely a wonder to behold! Moreover we noticed that there were two differently coloured varieties in one of the pots for sale and we grabbed that without hesitation sometime late November, 2013. Our plants appear to be the dwarf type. A very hardy and reliable flowering plant that keeps blooming happily in ideal conditions, in our tropical country, Malaysia which has everlasting summers. 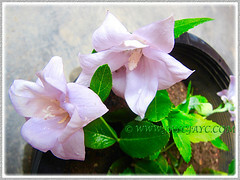 Botanical Name: Platycodon grandiflorus (Syn. 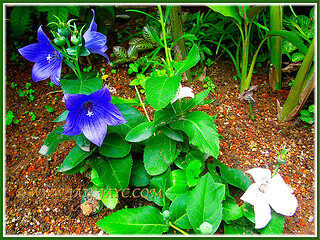 : Campanula grandiflora, Campanula glauca, Platycodon leweri, Platycodon glaucus). 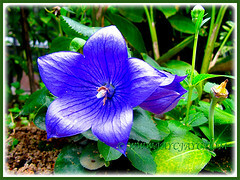 Common Name: Balloon Flower, Platycodon, Chinese Balloon Flower, Korean Bellflower (Doraji), Chinese Bellflower (Jie Geng) and Japanese Bellflower (Kikyo). 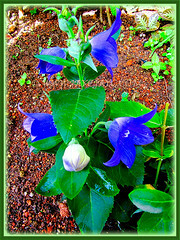 Etymology: Platycodon grandiflorus is from a Greek word, meaning a broad bell, referring to the shape of its flowers. Origin: Native to East Asia: China, Korea, Japan and East Siberia. Plant type: A herbaceous flowering perennial plant. 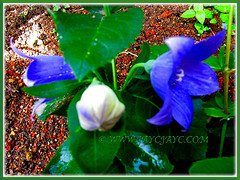 Features: Platycodon grandiflorus is a captivating species and the only member of the genus, Platycodon. It is a clump-forming perennial with tall varieties that generally reach between 0.76-1.07 m in height, while the dwarf varieties grow to about 15-30 cm tall. The tall varieties are upright-growing while the compact dwarf varieties tend to be more rounded. The dense foliage with blue-green to medium green ovate leaves that are toothed or serrated provide a wonderful backdrop. It is an everblooming plant with terminal clusters of large 5 cm cup-shaped flowers which pop open from balloon-shaped flower buds. These blooms can be in single or double varieties. Its captivating flowers can be in various hues of violet-blue, purple, pink, white, and even bicoloured in white and speckled in purple. 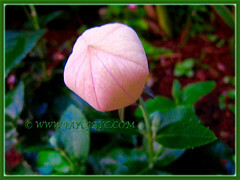 The common name, Balloon Flower is derived from the unopened balloon-like flower buds. Eventually the flowers are followed by seedpods and if left to ripen, turn brown and dried completely, will contain tiny seeds that can be used to germinate new plants. Culture (Care): Platycodon grandiflorus grows easily with minimum care. Moisture: Average water requirement. Water regularly especially during dry seasons but avoid overwatering which can cause root rot. Soil: Grow in humus-enriched loamy and well drained soils. 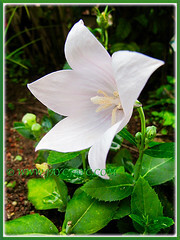 Others: Taller varieties of Bellflower needs staking. Deadhead the fading blooms to encourage new growth or allow the seed pods that contain tiny brown seeds to ripen (turning brown and dried completely), to propagate new plants. Feed once monthly with a balanced slow-release fertiliser. Watch our for slugs and snails. Generally free from serious pests and diseases. For subtropical and temperate regions: Hardiness: USDA Zone 3a-9b. Provide full sun in cool areas but part shade where summers are hot. Water sparingly during the rest period but abundantly during the active growth period. Cut the plant back to base in autumn and spread a layer of mulch for winter protection. If plant stakes are used to support taller varieties of Balloon Flowers, leave the stakes as is to mark the plant’s location. Plant the flower seeds in spring when frost-free. Flowering commences in spring to fall. Its foliage provides sparkling autumn foliage colours. Propagation: Easiest by seed germination that takes about 2 weeks for seedlings to sprout. It can be propagated by division or separation. Divide only when the clump becomes overcrowded as it dislikes disturbance of its tuberous roots. 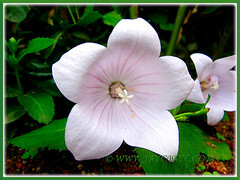 Usage: Plant Balloon Flower or Bellflower as a showy ornamental plant. Ideal to be planted in flower border and bed fronts. The dwarf varieties are suitable in rock gardens. Excellent in containers or raised planters. Can be used as cut flowers too. While researching on Platycodon grandiflorus, I came across at Chinese Herbs Healing that it has medicinal benefits and being long used traditionally in China, while the roots are used in salads and traditional cuisine in Korea. Hi Jacqueline, this flower is extraordinarily beautiful, thank you for showing. We are waiting for rain, a big hug friend. We agree, it is indeed a captivating beauty. Pray your region have showers of rain and especially for you… abundant showers of God’s blessings. Love and big hug to you too, my friend. Amen and thank you very much friend.